The Nazca Lines, a series of fantastical geoglyphs etched into the desert in Peru, may have been used by two separate groups of people to make pilgrimage to an ancient temple, new research suggests. But the purpose of the desert etchings may have changed over time. The earliest Nazca Lines were created so pilgrims could view the markings along a ritual processional route, the researchers said. But later people may have smashed ceramic pots on the ground where the lines intersected as part of an ancient religious rite, according to a study presented here on April 16 at the 80th annual meeting of the Society for American Archeology. In one of the driest places on Earth, locked between the Andes Mountains and the coast, more than a thousand geoglyphs dot the landscape. People from an ancient civilization created the shapes between 200 B.C. and A.D. 600, by removing the reddish rocks on the surface of the desert, revealing the white-hued earth beneath. The strange shapes in the desert include animals such as camelids, dogs and monkeys, as well as fanciful supernatural beings, scenes of decapitation and trophy heads, and geometric designs such as trapezoids, lines and triangles. Though the mysterious shapes gained widespread attention in the 1920s, when plane passengers saw them from above, people who lived there likely saw them even earlier while walking the hilltops in the Nazca plateau. 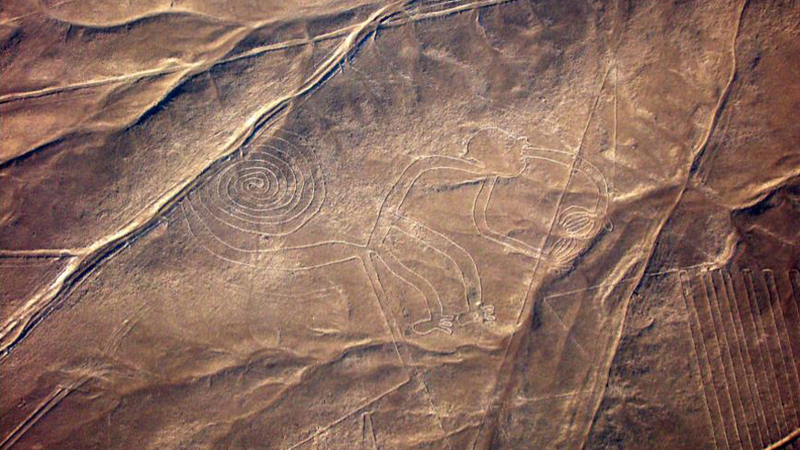 Archaeologists have long puzzled over the purpose of the Nazca Lines. Some researchers have argued the Nazca lines form a labyrinth. Others have said the lines and figures matched up with the constellations in the sky or with subterranean water routes. And still others have said the Nazca Lines were part of an ancient pilgrimage route. In recent years, researchers at Yamagata University in Japan have uncovered 100 geoglpyhs, as well as shards of broken ceramics at the intersection points of some of the lines. In addition to showing different content, the geoglyphs were also constructed differently from each other, made by removing rocks from the interior of the images in some cases and the border in others, Sakai said. For instance, images of animals such as condors and camelids were found along a route that started from the Ingenio River, which the team roughly categorized as type A and type B, respectively. "The geoglyphs of type A and B are located not only in the area adjacent to the Ingenio Valley but along the pathway to Cahuachi. Therefore it seems reasonable to assume that type A and B geoglyphs were drawn by the group from the Ingenio Valley," Sakai told Live Science. Meanwhile, a separate style of images, such as the supernatural beings and the trophy heads, were concentrated in the Nazca Valley and its route to Cahuachi, likely made by a distinct group of people who lived in that region. A third group of geoglyphs, likely made by both groups, was found in the Nazca Plateau between the two cultures. The purpose of the geoglyphs may have also changed over time from what archaeologists call the final Formative period, which spanned until A.D. 200, to the early Nazca period, which ended in A.D. 450. The smashed ceramics dated to the later period. "Our research revealed that the Formative geoglyphs were placed to be seen from the ritual pathways, while those of the early Nazca period were used as the loci of ritual activities such as intentional destructions of ceramic vessels," Sakai said. And the ancient desert inhabitants continued making the lines beyond that time, Sakai said. "Even after the collapse of the Cahuachi temple, trapezoids and straight lines continued to be made and used," Sakai said.